Archetype Coffee was founded in May of 2014 by our friend Isaiah Sheese with the goal of adding to the coffee community in Omaha, Nebraska as well as being a part of and contributing to the growth of interest and knowledge of coffee nationally and globally. 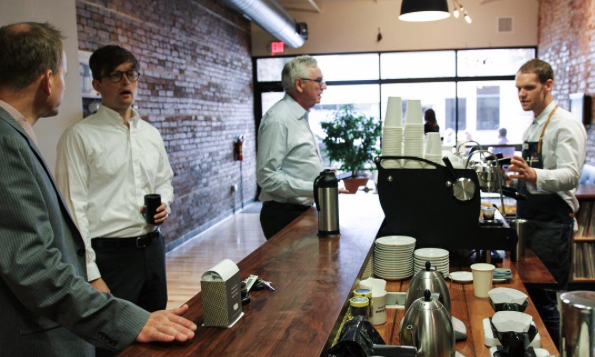 We got to hear from Archetype’s roaster Jason Burkum about the company and the city of Omaha! With the mission of “Brew Better, Do Better” Archetype Coffee is a cafe and roastery located in the Blackstone District of Omaha, Nebraska. “In a world where most of us are staring at screens all the time it’s great to see so many people having face to face interaction, all while having a great coffee experience, of course.” You can expect a friendly staff and a hive of activity in the shop with baristas working towards excellence in cup and service. “Our neighbors in The Blackstone District have a lot to offer, with lots of great food, beer, wine and the best ice cream around. Some of our faves are Scriptown, Nite Owl, Noli’s, and Coneflower. There’s also a great guitar shop and record store here in Blackstone. “We typically think of coffees as either comforting or adventurous. Comforting leaning toward richer more chocolaty flavors and a heavier mouthfeel, and adventurous tipping toward bright, juicy acidity and more fruit-forward flavors.” We really like the more adventurous profile of the Panama Camiseta Estate! We’ll have the Camiseta Estate on bar for just a little longer so grab a cup and let us know what you think!